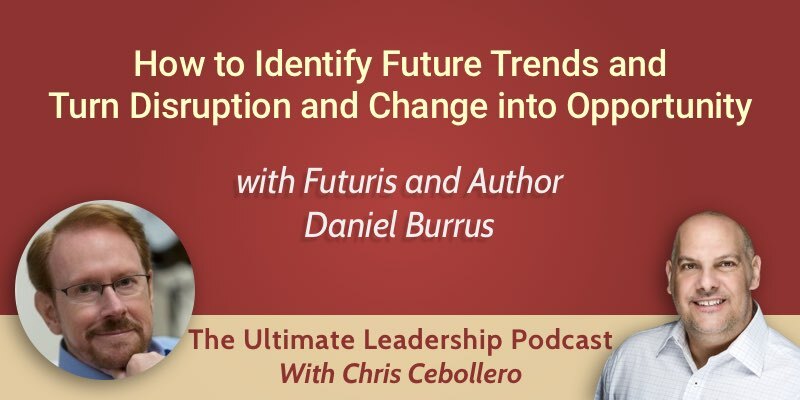 On today’s podcast, we’re joined by the world’s leading futurist on global trends and innovations, and author of The Anticipatory Organization: Turn disruption and change into opportunity and advantage, Daniel Burrus. Daniel will be sharing his extensive knowledge to help you understand how trends can be predicted, and how to utilize these trends to develop your business. What is the Anticipatory Organization model? How do you identify the next trend? The Anticipatory Organization Model provides a framework for identifying certainties in the market and for leaping ahead of your competition with much lower risk. Developed by today’s guest Daniel Burrus, it is used by some of the largest companies in the world and has seen outstanding results. Many organizations believe that agility is the most important competency for an organization to possess. Daniel believes that reacting to problems and digital disruptions, no matter how agile you or your organization are, is no longer good enough. The world is moving at a technology driven pace which is exponential in its rate. So organizations need a way to identify the direction in which technology is moving. By using the methodology that Daniel teaches in his book, organizations can see disruptions before they disrupt. This foresight allows you to identify the problems that you or your customer are going to have before they happen, and pre-solve them. What’s more, it gives you the ability to see game-changing opportunities upon which you can base your own innovations with low risk. Most of us don’t spend much time looking at trends, and when we do the difficulty is identifying which ones will happen. Daniel believes there are only really two types of trend and that once you understand their characteristics you’ll be better placed to predict which will happen. Hard trends are based on future facts. They provide you with certainty in a seemingly uncertain world, and a business strategy based on certainty is low risk. Soft trends are based on an assumption. Often business leaders believe that assumption is a fact and treat it as such. As a result, soft trends carry higher risk. Predicting everything is not realistic so organizations need to be agile and able to react fast to the unseen. The new competency that Daniel has identified is how much you can see and pre-act on before the future event. With the pace of change ever increasing it’s better to get ahead of it than to languish behind it. Daniel teaches that it’s easier than you might think to identify trends. Particularly in the case of hard trends which tend to fall within very clear identifiable categories. As an example, in the US there are 78 million baby boomers and it’s a hard trend that they’re going to get older. With this hard trend comes the opportunity to identify the problems this will cause and pre-solve them, creating business opportunities in the process. These baby boomers will get older, when they do what will their needs be and how can you solve them before the problems arise. Technology is amazingly predictable. We have 4G wireless, you’ve heard about 5G wireless so can you predict what is coming next? 6G. The same applies to storing information on the cloud, it’s a hard trend that will continue to grow. When a new law is passed we instinctively look at all of the things about it that we don’t like. Daniel suggests that you should be looking at the things you do like. Look for the areas of these new laws that will cause issues for others and create a service that will solve this. Using this method of identification you can Innovate with low risk. Many leaders are afraid of disruptions. This is due to previous experiences of disruptions that have hit hard and messed things up. Disruption can mess up your career, products, services, customers, and people do not like this kind of disruption. Leaders often believe that no one likes change which causes fear of disruption. This is not always true since not all change is negative. So what’s the bad kind of change? It’s the kind that catches you by surprise. According to Daniel most of the time, these changes could have been predicted. There are ways that you can see these things coming and Daniel’s book has a methodology that allows you to do just that.